The Thermonuclear Smoke Devil is a Smoke Devil boss found within the Smoke Devil Dungeon. 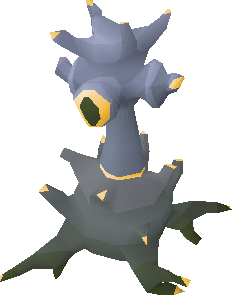 The Thermonuclear Smoke Devil can only be fought while on a slayer task for Smoke Devils or a boss task for Thermonuclear Smoke Devils and has a slayer level requirement of 93. The Thermonuclear Smoke Devil is not a very popular boss, however it is the only creature that drops the Smoke Battlestaff and the Occult Necklace in the game. The most common tactic to use at the Thermonuclear Smoke Devil is to use melee in combination with magic defence, protection prayers are not effective. The Thermonuclear Smoke Devil is a relatively simple boss with very few tactics involved. Thermy a max hit of only 8 but has a very high attack speed. You can utilize the ‘step under’ technique in order to take less hits from Thermy. What you should do is hit Thermy once, then immediately run under him so that he is unable to attack you until one of you move. This will give you a couple of seconds to eat if you need to, and then jump out from under him and immediately return to attacking. In this manner, you will drastically reduce the amount of damage you take from Thermy and extend the length of your trips considerably. You can swap the Dragon Claws out for any other decent special attack weapon.